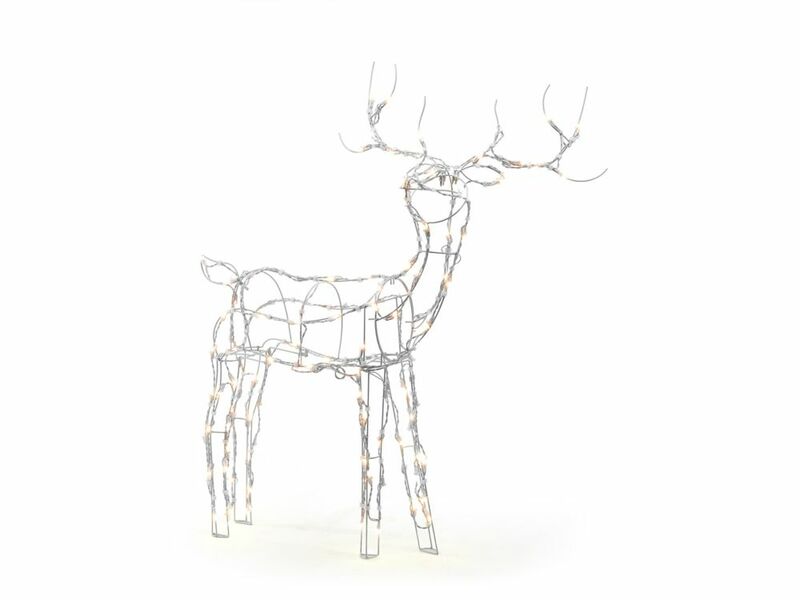 Brighten up your holidays with this 52-inch 120-Light LED White Wire Reindeer. Made with sturdy wire construction and covered with 120 LED lights to make an attractive decorative item. The LED lights are cUL approved and come with a 60 inch lead in. This island/billiard will update your home with its eye-catching design. Featuring a chrome finish and white shade(s), this fixture will accommodate a variety of dicor styles. With its easy installation and low upkeep requirements, this island/billiard will not disappoint. With power efficient, long lasting LEDs as its light source, the Globe Electric Weather Resistant Dusk to Dawn Adjustable Motion Activated Security Light is maintenance free once installed. LED bulbs last approximately 32,000 hours, so bulb replacement will be the last thing you worry about. Compared with traditional security fixtures, LED fixtures provide brighter, more even lighting while consuming much less energy. With motion activation for up to 40ft and an 180 front and downward detection sensor your home, garage, office or building will never feel safer. Give your home a little southern charm with this Mason Jar Vase Set. Its floral accents and natural crate finish are an ideal addition to any home decor style. Create a beautiful tablescape with this decorative wood tray with mason jars. For decorative use onlyCare: Dust with a soft, dry cloth. ilumi Smart bulbs unlock the natural power of light giving you better lighting for better living. Just screw in an ilumi Smart bulb like a regular bulb, download the free ilumi app, and enjoy luxury lighting at your fingertips. Transform your living room into a Zen-like resort with a colourful daily sunrise that eases you out of bed and wellness lighting that shifts throughout the day to support your bodys natural rhythm. Let your light guide your path, automatically turning on and off as you move from room to room. Or just set exactly the right shade of white light for you - not too cool, not too warm, but just right. ilium's Hyper Lux LED technology delivers bright whites and vibrant colours across the rainbow with efficiency and life that lasts up to 20 years. A brain inside every ilumi means your settings, preferences, and schedules are saved and work whether you use the ilumi app or your regular switch. ilumi Smart bulbs provide better lighting for better living. 52-inch 120-Light LED White Wire Reindeer Brighten up your holidays with this 52-inch 120-Light LED White Wire Reindeer. Made with sturdy wire construction and covered with 120 LED lights to make an attractive decorative item. The LED lights are cUL approved and come with a 60 inch lead in.